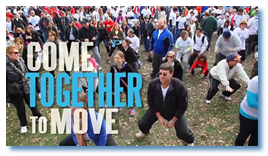 Taking place in cities across the United States, Moving Day® is your chance to speak up about Parkinson’s disease and move others to take action. It is a movement for change—towards more awareness, more funding, and more understanding of a disease that affects so many of our family and friends. Raising awareness, raising funds. Sometimes in rain, sometimes sun! Check out our slideshow from our Moving Day® 2016 events! Were you there? Were you captured MOVING that day? View now! Watch and share our inspirational Moving Day® recruitment video. Join the movement today! View here! Find a Moving Day® event to support. Find a Moving Day® walker or team to support. Find a Moving Day® team to support.